Everyone in my family knows when I make FUNFETTI Cookie Cake it means we are celebrating something in our family. Whether it’s a birthday, anniversary, a holiday or if you are like me who is celebrating that groundhog, Punxsutawney Phil did not see his shadow today. YAY, to spring coming early! 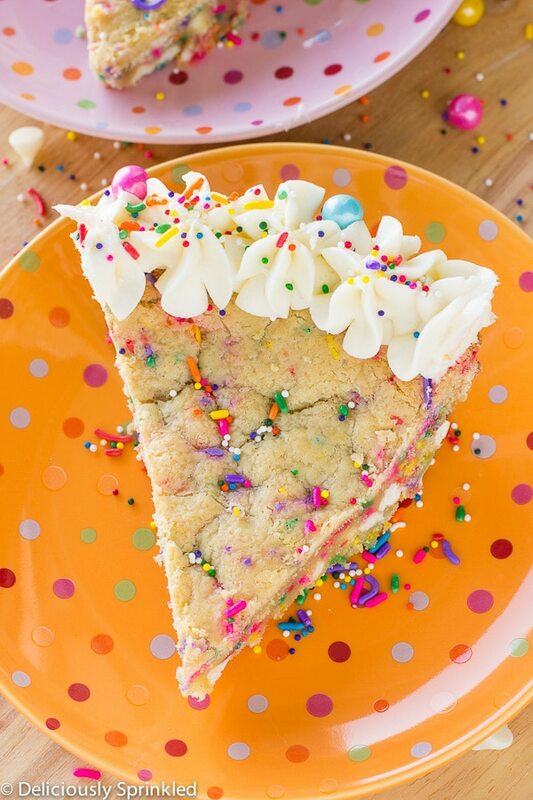 And the best part is that this Funfetti Cookie Cake takes no time at all to make. 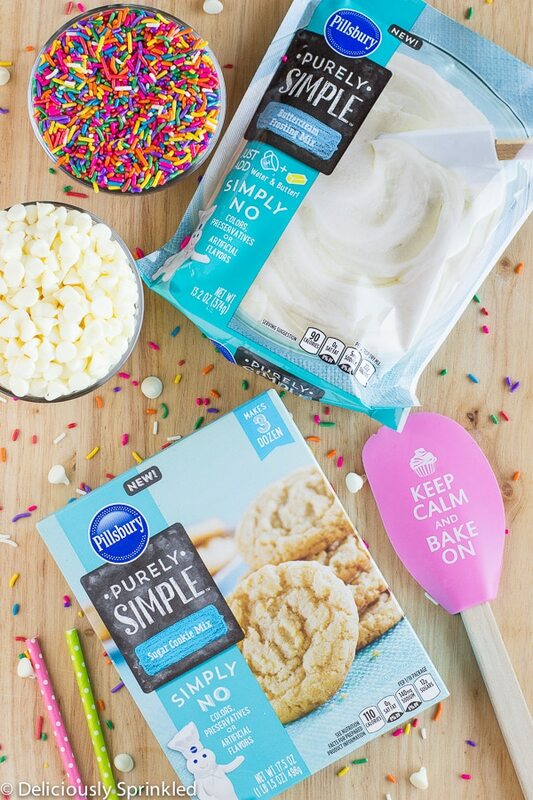 It starts out by using my new favorite Pillsbury Purely Simple Sugar Cookie Mix . To make this cake super fun, I added white chocolate chips which really adds a deliciousness to the sugar cookie. 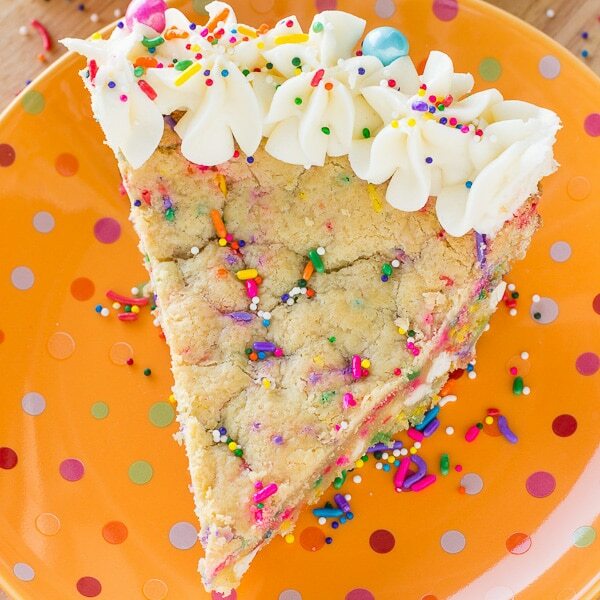 Lastly, you know it’s not a celebration at our house without SPRINKLES, which I added a ton of SPRINKLES to the sugar cookie dough to make it this cookie cake be a Funfetti Cookie Cake. I also used the new Pillsbury Purely Simple Buttercream Frosting Mix and let me tell you, I don’t think I will make frosting any other way again, it was so easy to make and the frosting tasted delicious. 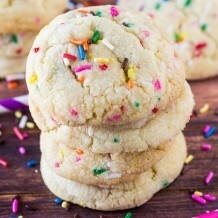 ✓ SOFTENED BUTTER: For both the sugar cookie mix and the buttercream frosting mix you will NEED to use softened butter. So if you are like me who always seems to forget to set the butter out on the counter to let it soften, here is a trick to soften butter quickly. 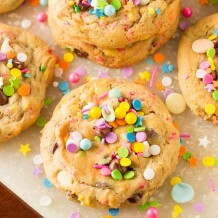 ✓ SPRINKLES: It’s important to use regular rainbow sprinkles to mix into the sugar cookie dough. If you use nonpareils (the little ball sprinkles), they will bleed into the cookie dough and turn in a nasty brownish/green color…GROSS! But feel free to use the nonpareils sprinkles for decorating, like I did. PRE-STEP: Preheat oven to 350F degrees. Spray a 9-inch pie dish or cake pan with nonstick spray. Set aside. STEP 1: In a large bowl, using an electric or stand mixer, beat cookie mix, butter and egg until dough is formed. 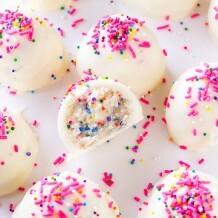 STEP 2: Stir in white chocolate chips and sprinkles. STEP 3: Press cookie dough evenly into prepared pie dish. Bake for 25-30 minutes or until the top is lightly brown. Let cool on wire rack before frosting. STEP 5: Add water and almond extract. Mix until frosting becomes light and fluffy. STEP 6: Frost the cake as desired, I used a Wilton 1M piping tip to decorate around the edges. Top frosting with sprinkles and cut into slices. * STORE: Cake in an airtight container in the refrigerator for up to 5 days. So pretty! I love cookie cakes! Do they sell the “Purely Simple” products in the Baraboo area? What is it about funfetti that just makes me smile 🙂 So pretty! Can this recipe be doubled and put in a 9×13 pan?